The Today’s Hospitalist Web site is committed to preserving your personal information and does not collect personal information from site visitors unless they provide it. If you opt to receive e-mail alerts from Today’s Hospitalist, all such alerts contain an unsubscribe feature that allows you to discontinue these alerts. A cookie is a file that is stored on the visitor’s computer or Web server that is used to help navigate Web pages. Each time the Today’s Hospitalist Web server receives a request from a visitor to view a page, it checks to see if a cookie is present. This allows Today’s Hospitalist to track traffic to the site, such as determining how much traffic is from repeat visitors. You may use the Today’s Hospitalist Web site without accepting cookies. (Refer to the “help” option in your browser software.) Some services offered on the Today’s Hospitalist site, however, may not function properly if the cookies feature has been turned off. E-mail messages sent to or from a Web site may not be secure. Confidential information should not be sent by e-mail. Site visitors sending e-mail accept the risk that a third party may intercept e-mail messages. 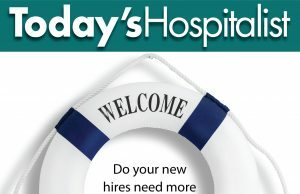 The Today’s Hospitalist Web site may disclose information about visitors if required to do so by law or in the good-faith belief that such action is necessary for a number of reasons, including but not limited to the following: conforming to legal requirements or legal processes served on the company; to protect and defend the rights and/or property of the company; to protect the safety of employees or site visitors. As the Today’s Hospitalist Web site changes, this privacy statement will change. Today’s Hospitalist and Roman Press Inc. reserve the right to amend this policy at any time and for any reason. Today’s Hospitalist will notify visitors that the policy has been amended by revising the last updated date that appears at the top of this policy. USER CONDUCT. You agree to act responsibly at this site and to treat visitors you encounter on the site with respect. LIMITED LICENSE/COPYRIGHT AND INTELLECTUAL PROPERTY LAW RESTRICTIONS. Except for public domain material, the content on this site and in our newsletters is protected by intellectual property laws, including U.S. copyright laws. You are hereby granted a non-exclusive license to use the material at this site while connected to this site. (For example, you may e-mail individual stories from this site to colleagues.) You are also granted a limited license to print one copy of any content posted at the site for your personal use or to share with a colleague. Except as expressly provided above, all rights are reserved and electronic reproduction, adaptation, distribution, performance or display is prohibited. Deletion of author attribution or copyright notices is prohibited. Commercial use of any of the content on this site is strictly prohibited. Use of any of our trademarks as metatags on other Web sites is prohibited without written permission from the Editor, which may be requested at edoyle@todayshospitalist.com. You may not display a visual graphic of this Web site or any of the content via in-line links without our express written permission, which may be requested by contacting the Editor at edoyle@todayshospitalist.com. LINKS. You may establish links to our site without our written permission. Links we provide from our site to other sites are intended as a convenience to our visitors. However, we have no control over linked sites nor any of the content at these locations. Links do not imply sponsorship, affiliation or endorsement. RECRUITMENT ADS, DISCUSSION BOARDS AND OTHER SELF-PUBLISHING THIRD PARTY PRODUCTS. Although we do not have any obligation to monitor these services or this self-published content, we reserve the right at all times to remove any information or materials that are unlawful, threatening, abusive, libelous, defamatory, obscene, vulgar, pornographic, profane, indecent or otherwise objectionable to us in our sole discretion, and to disclose any information necessary to satisfy the law, regulation or government request. We also reserve the right to permanently block any user who violates these terms and conditions. DISCLAIMER OF WARRANTIES. Use of this Web site and its content is at your sole risk. We do not provide a warranty for any results based on your use of this site; nor do we provide guarantees against interruptions in the course of your access of this site or errors encountered during your use of this site. This site is available to you on an “as is” basis without any express or implied warranty, including but not limited to warranties of merchantability, fitness for a particular purpose-non-infringement or otherwise-other than those that are incapable of exclusion under the laws applicable to this agreement. LIMITATION OF LIABILITY. Neither we nor any other person or entity providing content through this site shall be liable for any direct, indirect, incidental, special or consequential damages resulting from the use of this Web site or any content contained herein. Further, we shall have no liability to you or other third parties for any content uploaded or downloaded in connection with our newsletters or Web site other than those that are incapable of exclusion under the laws applicable to this agreement. You further agree to indemnify and hold us harmless from and against any loss, cost, damages, liability and/or expense arising out of or relating to third-party claims, actions or allegations. MODIFICATIONS/TERMINATION. Modification to these terms and conditions (or discontinuation of this site) is in our sole discretion. Your right to access this site is conditioned on an ongoing basis with your compliance with the most up-to-date version of these Terms and Conditions. You should therefore visit this page frequently. JURISDICTION AND INDEMNIFICATION. This Web site is hosted on servers located in the United States and is intended to be viewed by residents of the United States. In the event of any dispute arising out of or relating to this site, you agree that the exclusive venue for litigating disputes shall be in state or federal court in Pennsylvania. Today’s Hospitalist and Roman Press Inc., nor any of its subsidiaries or affiliate entities, agents, employees, or subcontractors shall be liable for any direct, indirect, special, incidental, consequential, punitive, or exemplary damages that arise in any way from the information contained in this Web site, or any information transmitted via this Web site. Today’s Hospitalist and Roman Press Inc. are not liable for any damages or losses that may be caused to any equipment and other software due to any viruses, defects or malfunctions in connection with access or use of this Web site.